It’s not often that you see a good Amazon Prime discount, but for 1-day only (that being today), you can grab a membership to Amazon for just $67. 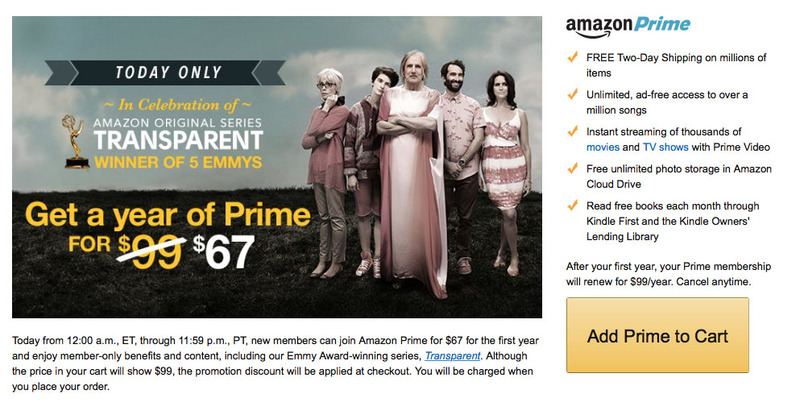 The price cut is as a nod to the 5 Emmy wins for Amazon’s show, Transparent. As a reminder, Amazon Prime gets you free two-day shipping on many of their items and is generally the reason people sign up for it. It also gets you 1-day shipping for $3.99. It’s awesome. Along with the shipping goodness, Prime memberships also get access to Amazon’s video and music services, free books, and unlimited cloud storage. Prime is normally $99 per year, so you are looking at a solid $32 discount today.